Learn about my upcoming events and book me for a party! Today I am showing you a very simple card which uses a technique which requires very minimal equipment but gives a great effect and looks beautiful! With autumn well and truly here I have focused on natural colours and have played around with copper embossing powder. 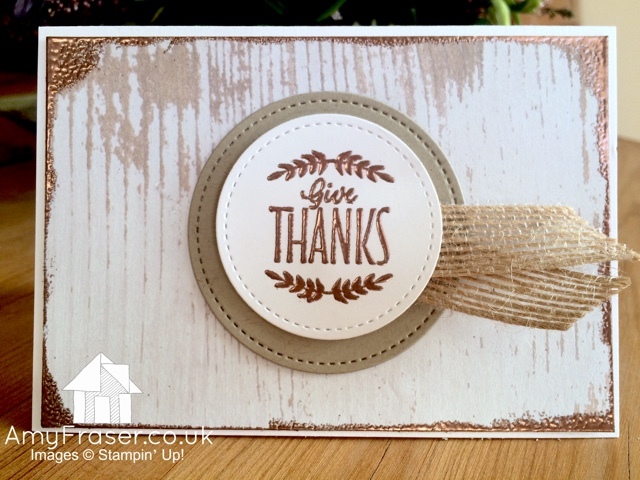 As you can see here I embossed the beautiful give thanks sentiment from the Labels to Love stamp set. I also embossed the edges of the woodgrain dsp that I used. I wanted to give the paper a more natural and distressed vibe for this card and to really highlight the beautiful copper colour that just makes me think of autumn leaves. This effect is really easy to achieve. I just use the Versamark ink pad and lightly scrape the edges of the paper along the pad, when I get to the corners I angle the pad towards the front of the paper a bit more to give a thicker edge. If you are careful when you do the edging you can get a very neat line but with this card the more haphazard the better. The stamp set I used is one of my favourites from the new autumn winter catalogue. It is a really versatile set and matches perfectly with our new label punch which is perfect for gift tags! This stamp set and its matching punch are a great starter purchase as all you need is paper and ink and you can make some really effective projects. Thanks for stopping by today. Let me know what colours you are being inspired to use by the changing weather! Unknown 8:00 am Balloons, Birthday, Cards, CASE, Pink, Sequins, Stampin' Up! Today I want to share with you a card I CASE'd a while ago. So long ago I can't remember where I got it from! I just remember seeing it an immediately putting it down in my sketch book to try myself. 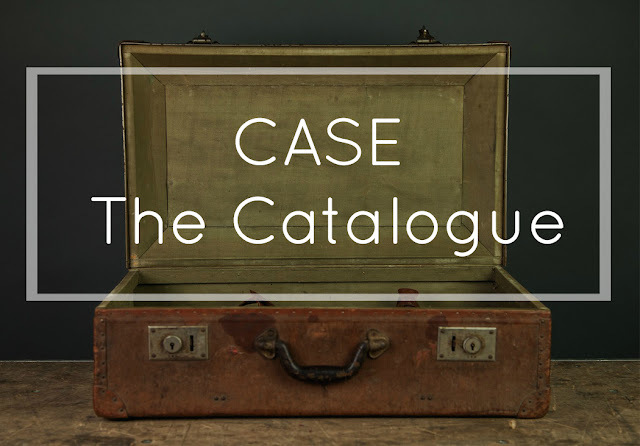 If you are new to CASE-ing, check out some of my previous CASE the Catalogue posts here. I have used the cute Balloon Celebrations stamp set along with the coordinating punch. 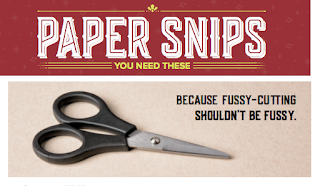 This card requires very little supplies and could be really good way of using up your scraps of card. I chose Flirty Flamingo along with Calypso Coral and Basic Black as my colours as I think it gives a really good effect. 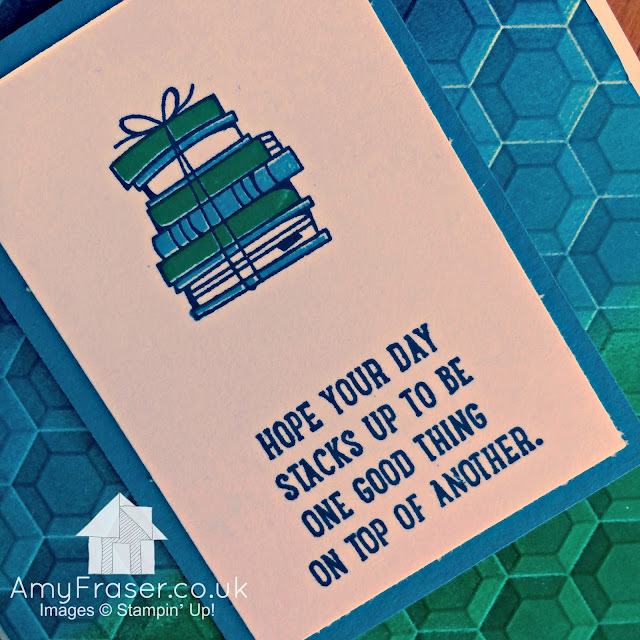 I have used a retired birthday sentiment on this card but I think the stylised birthday stamp would look perfect here too. 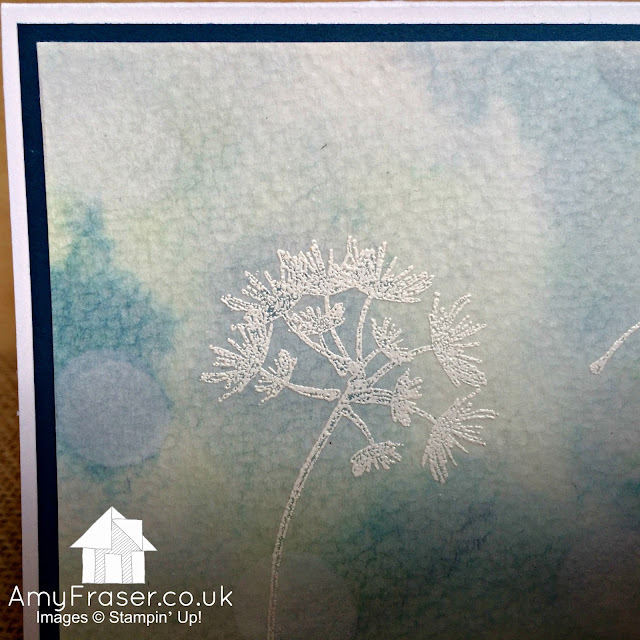 If you don't have two shades of the same colour you can still get the same effect as I used here by stamping off first.This means you stamp very gently on some scrap paper first to remove the significant ink before stamping as usual on your card. This leaves you with a lighter shade that co-ordinates perfectly with your main colour. I stamped on a small 11/2 inch strip of Whisper White and matted it on Basic Black. 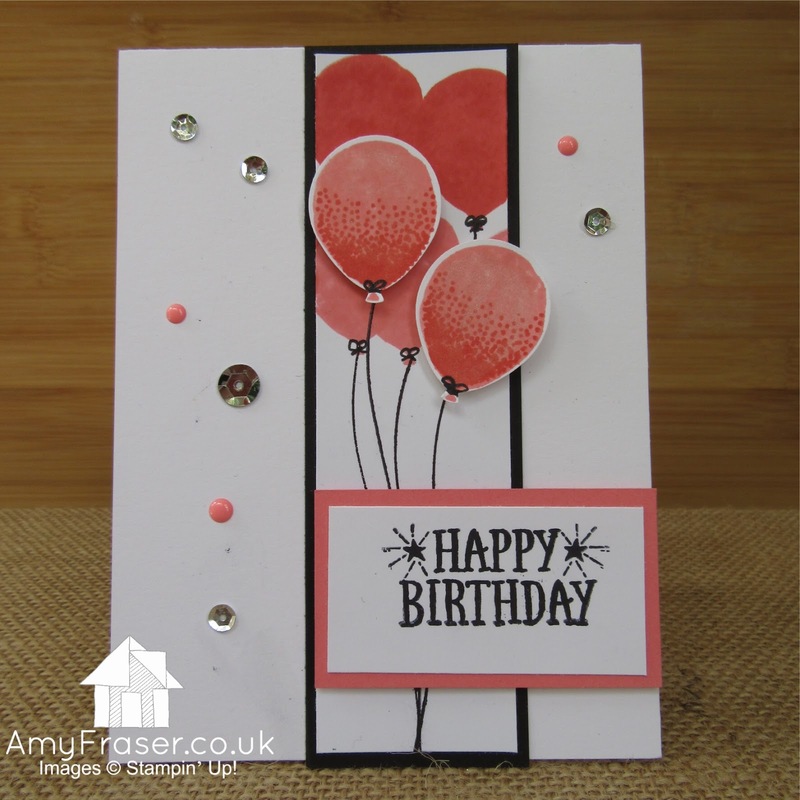 I stamped balloons in the lightest shade at the bottom and in the darker shade at the top. I then stamped two balloons using both colours and punched them out. I stamped the sentiment in Basic Black and matted it on Flirty Flamingo. I then layered all my items up. I added depth by adhering the birthday sentiment and two balloons on top with dimensionals. 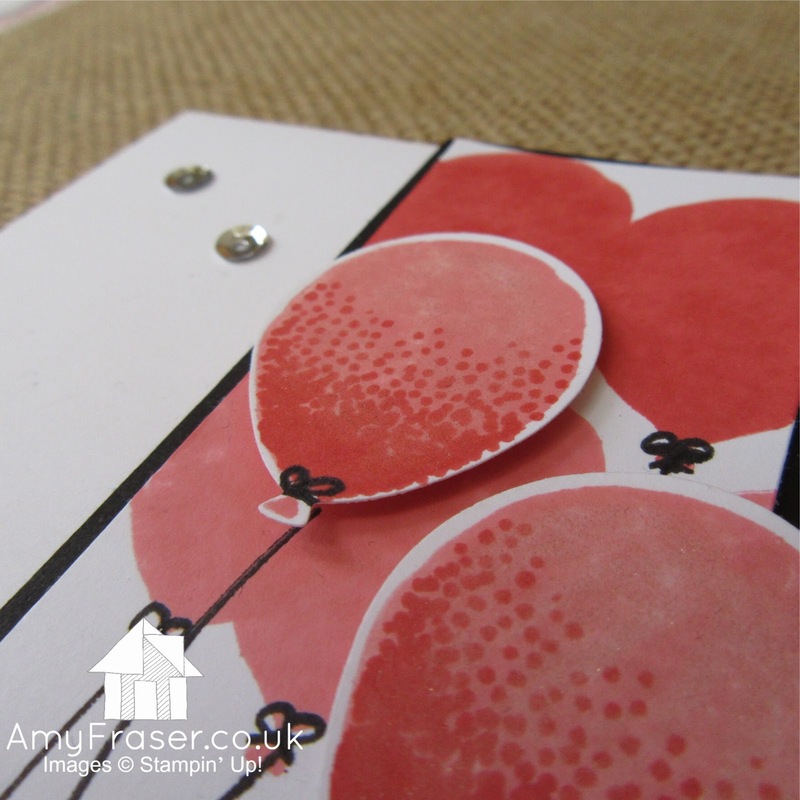 I drew the balloon strings using a Basic black stampin writer - one of the most essential items in a crafters box! 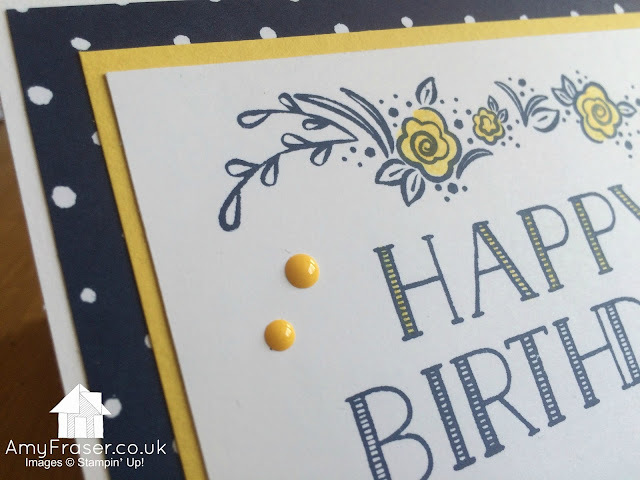 I finished off the card with some sequins and Enamel Shapes on the card and to add a little extra glitter I coloured the two front balloons with wink of stella. Next week I am going to be sharing items from the new autumn winter catalogue! The nights are drawing in and I am looking forward to lots of cosy evenings crafting away in my craft room. Where is your favourite place to craft? let me know in the comments below and why not share some of your recent makes with me? Unknown 12:00 pm Birthday, Cards, Daisy, Glitter, Stampin' Up! The wonderful Daisy Bundle is back in stock so today I thought I would share with you one of my newest makes. 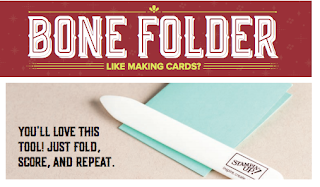 The process of putting together this card was really simple and it requires very few supplies. I even used some retired items! I have reverted back to an old faithful colour combination wise and chose chrushed curry and Dapper Denim. I really love the speckled effect of the colour theory paper a bit like that special paint you can buy that cracks and shows the colour underneath. I used some old retired thick bakers twine to make the centre of the flower. This is really easy to do but looks so cute, I use liquid glue to do this part so if you are considering making it you have to remember to let it dry! Not a last minute card I guess! 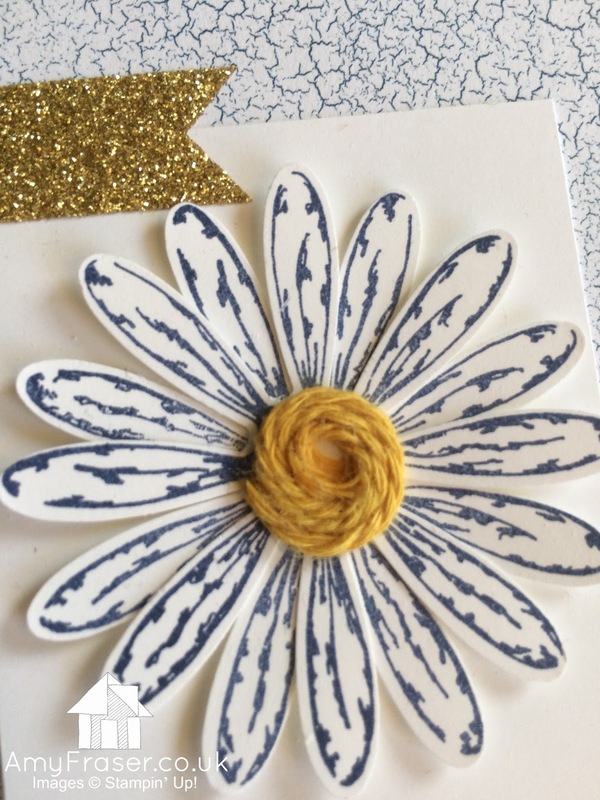 I used some gold Glimmer paper to set off the crushed curry centre and used dapper denim ink to stamp the daisy - to add depth to the daisy I stamped and punched two daisies and placed them on on top of the other giving a more full flower. I love the daisy in blue. While it's not a traditional choice, because of the way the stamp is drawn it gives the effect of shadow and I think it makes the daisy look more realistic! If you and your friends would like to get together and make this card for free please get in touch! Unknown 6:00 pm Baby, Birthday, Cards, featured, Little One, Makes, Stampin' Up! Over the past few years and even before I became a demonstrator I noticed I was ending up with a LOT of unused crafty stuff. Things I had decided that were too precious to use and so just sat looking pretty and gathering dust! Who else has this difficulty? I'm sure I am not the only one! Then with all the pretty new items in the catalogues and in shops you somehow forget about the pretty items you loved! Sometimes I have to remind myself to use these items and bring the love I originally felt for them back! So I've combined the new stamp set with some old items from previous catalogue to try and inspire you to use some of your collection of stash! Today I am sharing with you one of the most adorable stamps in the whole catalogue. It is such a cute little set and I personally think at less than £20 for the wood mount set it's also a bargain! 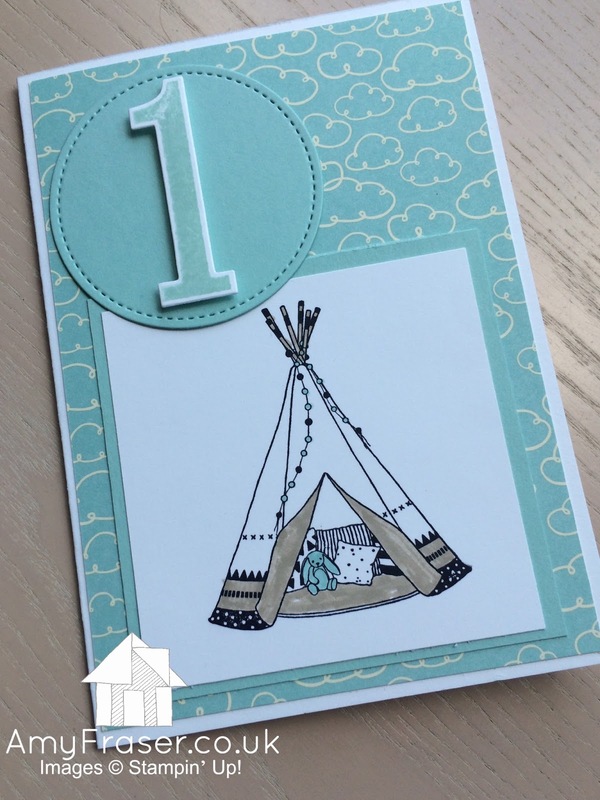 The set is called Little one and includes a sweet tepee ready to be coloured in. I love that this stamp set is not gender specific so can be used for all baby and child cards. I am looking forward to branching out in the future with this stamp set and not just using it for baby cards! Maybe a camping scrapbook page? I had a need for a last minute birthday card for a first birthday party. I was so excited to use this set and I think the card worked out really well. 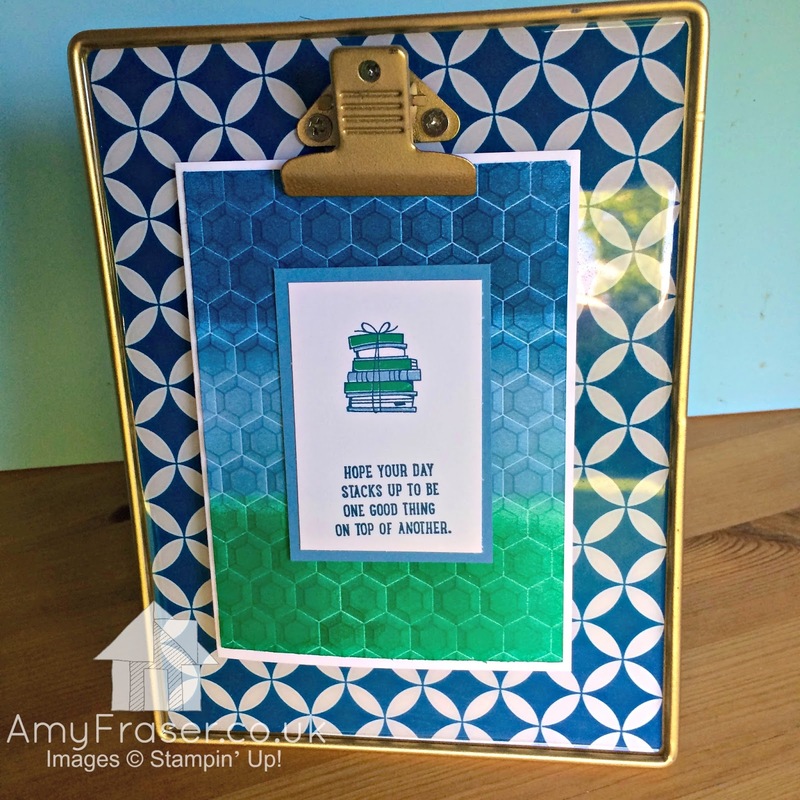 I focused on coordination and used Pool Party ink for the colouring, stamping and matting. Having these coordinated items means bringing a card together is really quick when you need it to be! I had some left over retired paper from a while ago called sweet lil' thing. I love that even though this paper is no longer for sale I know that I can use it because all the colours just match perfectly! Can we also take a moment to appreciate the stitched framelits? I think they take cards to the next level and look so professional while being super simple! I have loved the alphabet and number stamps and dies since they came out and I think they work really well with the stitched framelits. 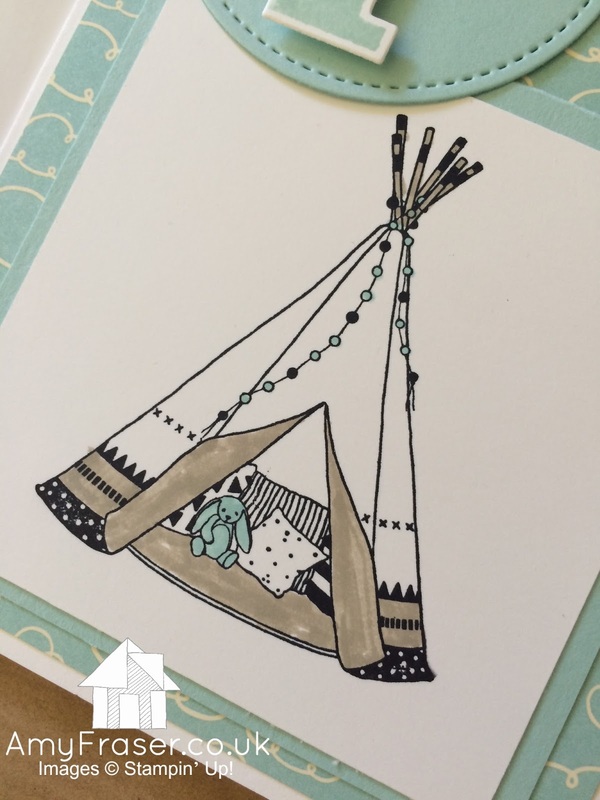 For this card I coloured in this little tepee using the Stampin' write markers but It can also be coloured in using the watercolour pencils or using ink and aqua painters or blender pens. As you can see I am not the greatest at colouring in the lines, but I think that adds to the love when giving the card! As you will know I am not the most artistic of people but I love that I can still be creative and achieve amazing results with the tools available to me from Stampin' up! Thanks for joining me today and taking a look at my newest creation! I hope it has inspired you to take out some of your old stash and mix it with some of your newest product! Don't forget the 2 great offers available during the month of July! 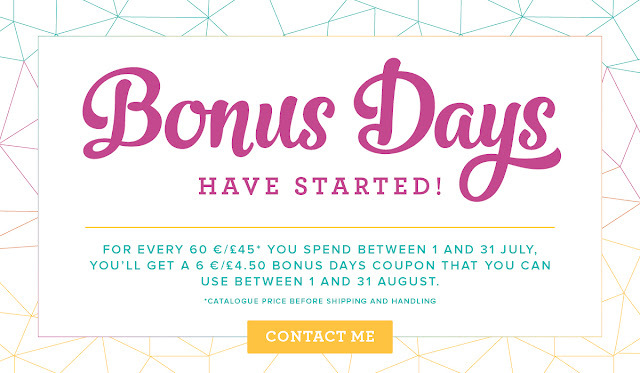 Bonus Days are here, which means for every £45 you spend in a single order in the month of July you will get a voucher for £4.50 to spend in August! That means if you order is £90 you'll get £9 to spend next month! 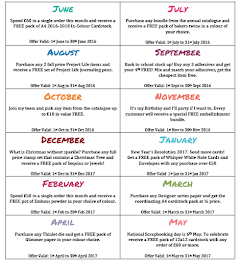 Or if you are interested in saving on all your orders until January why not consider the amazing joining offer Stampin' up! currently have! Not only do you get £130 worth of product for £99, during the month of July you will receive an essentials Gift pack worth £65 absolutely free! This gift pack is all about celebrating Christmas in July and includes a exclusive - not yet available to customers- stamp set! Interested? 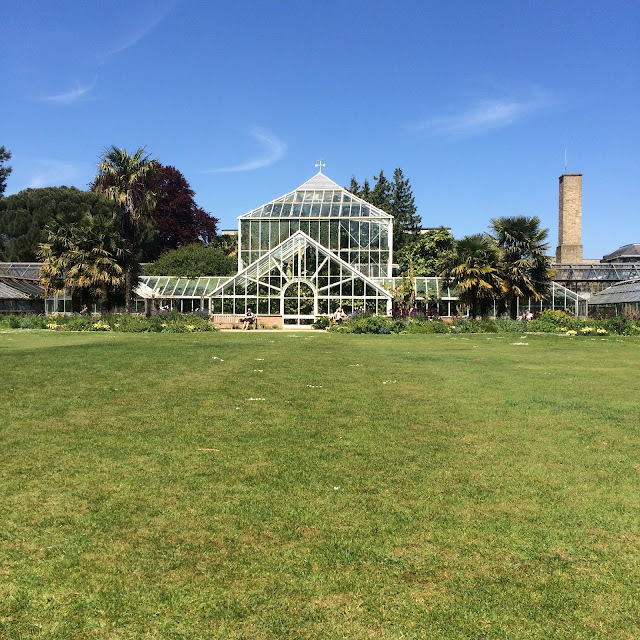 Check out my post from Yesterday to find out more! A discount until 31st January? Yes Please! Unknown 10:00 pm Deal, Demonstrator, Join my Team, Stampin' Up! 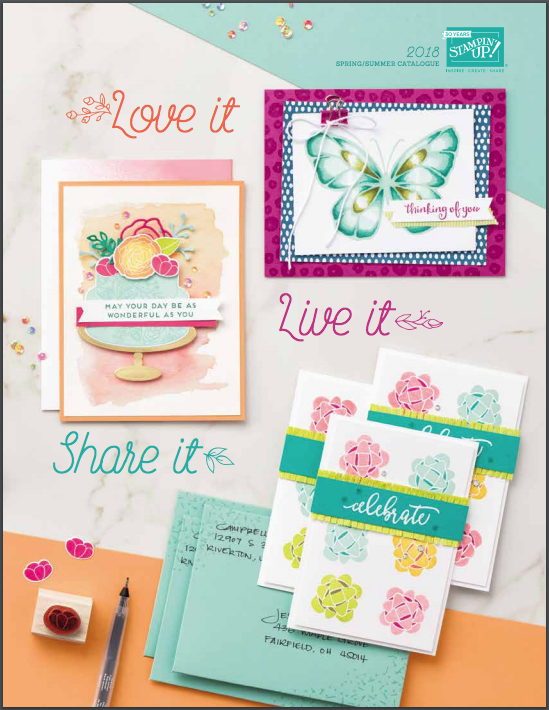 Today I want to tell you about the great joining offer available for the month of July and why I think now is one of the best times to Join Stampin' Up! Anyone who joins Stampin' Up! in the month of July will receive a discount on all their orders until the end of January 2018 no matter how much or little you spend! The starter kit is always one of the best offers in the catalogue as you get to pick £130 of product for your £99 and you get free delivery. The essential gift pack includes a number of the most useful items from the catalogue! You will also receive a brand new stamp set not yet released to customers absolutely free! 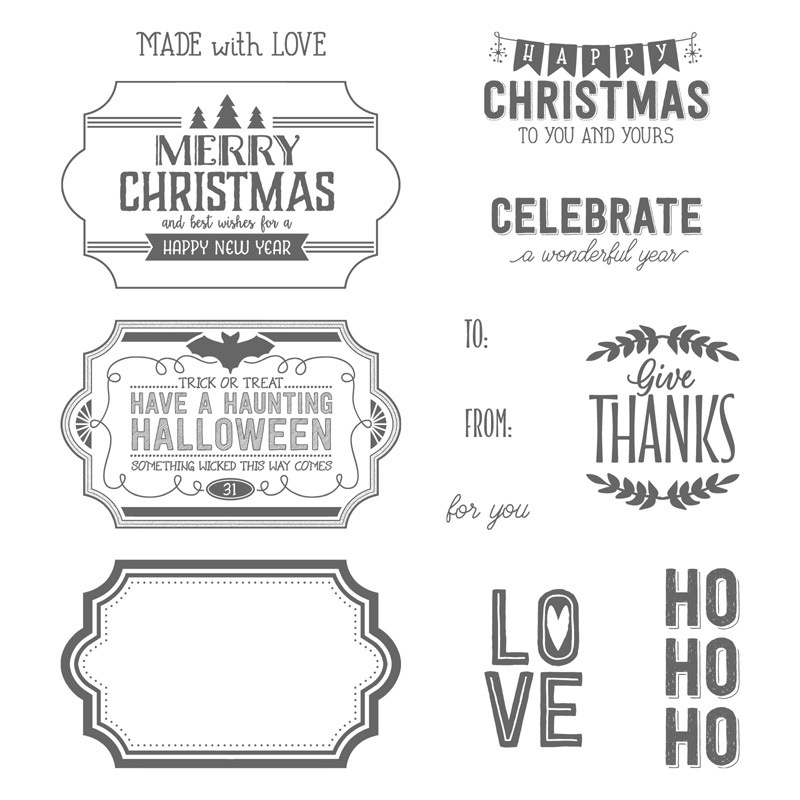 This stamp set will be appearing in the new Christmas catalogue and is really lovely. 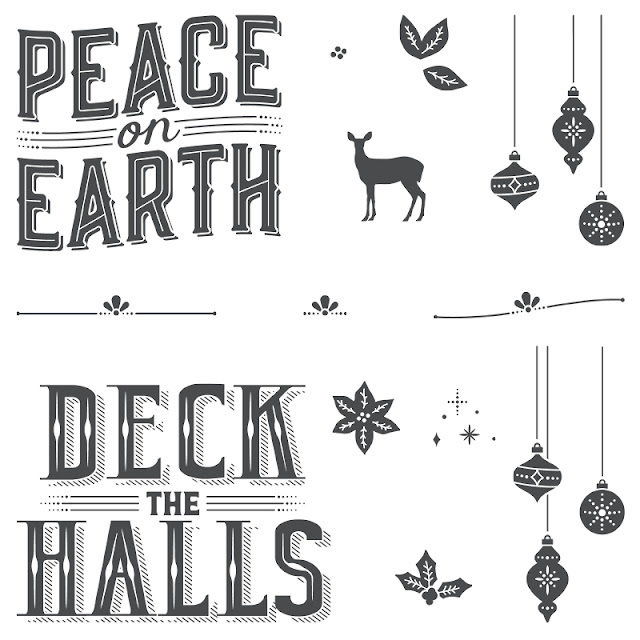 A great way to get started on your christmas crafting this month! All of these items lead to a total value of £195 when you buy the starter kit for £99. This truly is an amazing offer and one not to be missed if you have ever considered joining Stampin' up! Simply buy your starter kit and pick your £130 of product and the essentials gift pack will be automatically added to your delivery! If you are interested and ready to join follow this link to join my team! Please visit the join my team page or get in touch with me, I can help with any questions you might have and give you more information on this great deal! Tomorrow I will be sharing my latest make! Thanks for stopping by! Unknown 6:00 pm Cambridge, Cards, Stampin' Up! Today I'm sharing the first stamp set I saw from the new catalogue and the first card I made with it! It's called Bike Ride and I think it was a completely apt stamp set for me with my new home in Cambridge! I didn't immediately start with the bike stamp though, I wanted to use some of the accompanying stamps as I always seem to forget about the versatility of these stamps! 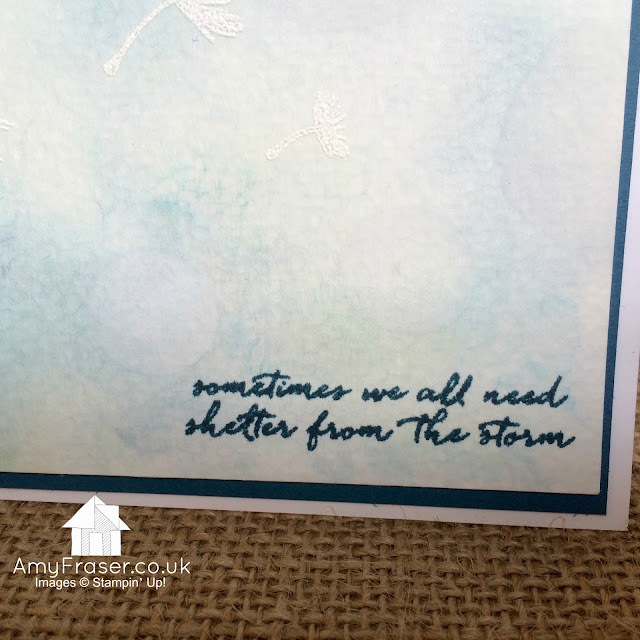 I used one of the new type of embossing folders that has been available since the spring/summer catalogue. The annual catalogue has even more embossing folders of this type and I really love them. They are called Dynamic textured impressions and they create extra deep and crisp textures. This particular folder is hexagons and I thought they were crying out to be brayered! I love the cute set of books, there are three stamps that I've used to make up this image. Each stamp adds an extra dimension to the image. The first is the outline and the second and third colour the book spines. I love the final effect. I also found the best sentiment to go with the book image. It is from the Sprinkles of life stamp set which was previously a charity stamp set for RMCH. The stamp set is no longer raising money for RMCH but it is still available (this years charity stamp set can be found here). 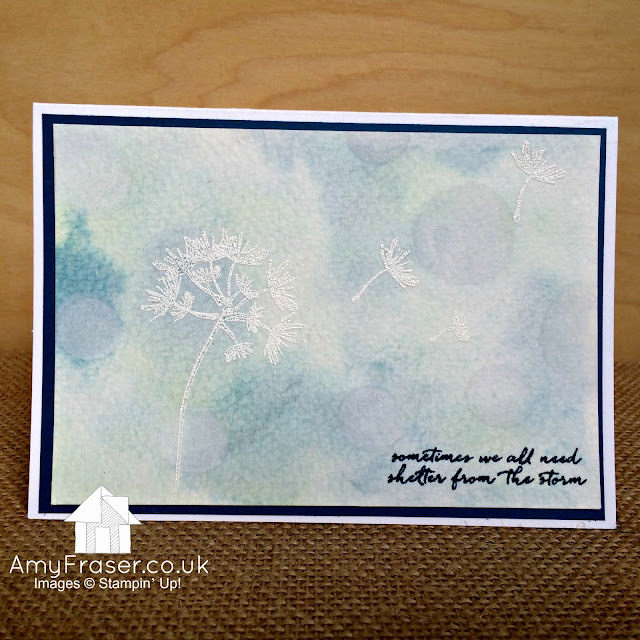 I wanted to use some less obvious colours in this card and so I decided to brayer a sort of Ombre effect using Emerald Envy, Dapper Denim and Marina Mist. The sponge brayers are the perfect size to do this inking without having to worry about getting the wrong colour ink elsewhere on the card. 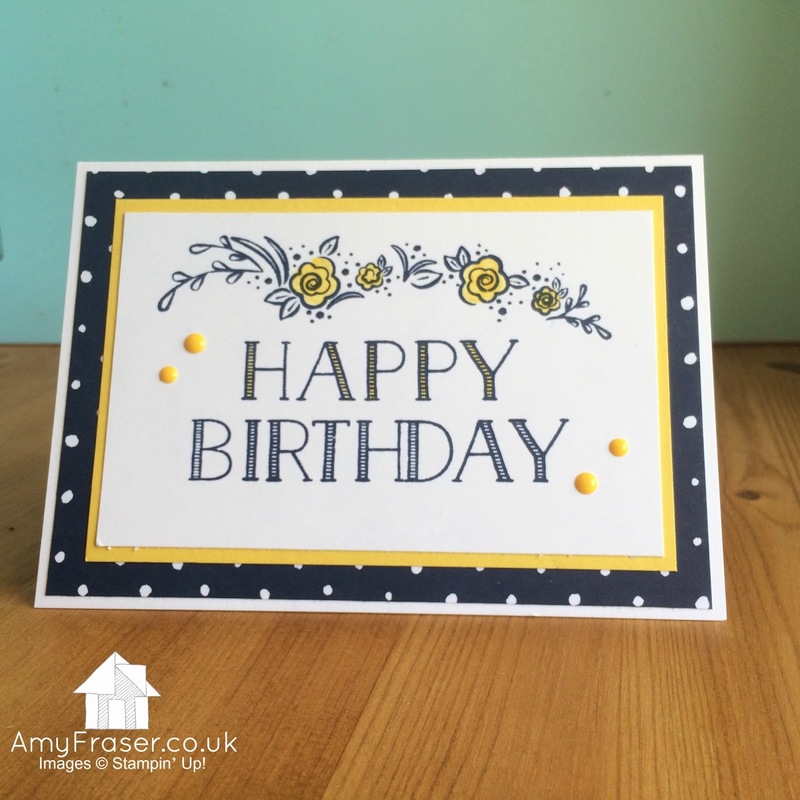 I have really enjoyed using this stamp set and can see many more cards being made in the next few months with it! Thanks for joining me today, I hope this card has given you some inspiration for your next card! Don't forget that during June there is the we 💙 hosts promotion which means you can earn an extra £30 stampin' rewards on a qualifying purchase or party. Please get in touch if you are interested in more information! Daisy Delight - Brighten Someones Day! 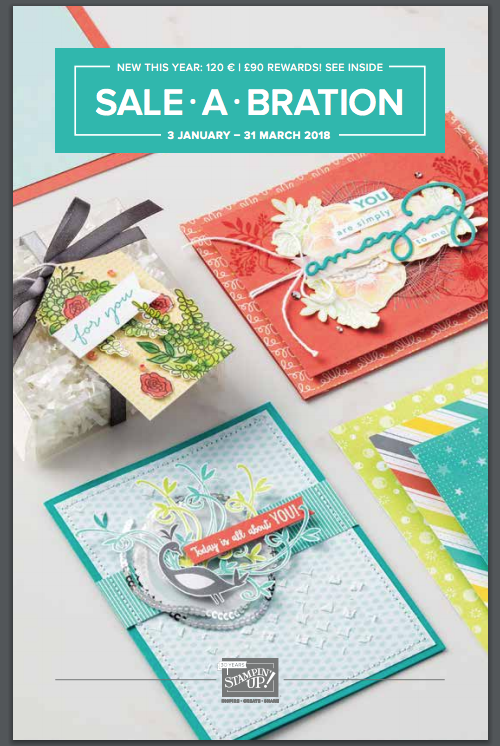 Today is the first day that you can get your hands on the brand new product from the Stampin' up annual catalogue. I have to say that this year I am in love with so many things and I really think that the products have been refreshed and modernised. I am looking forward to creating so many cards and other things that reflect me! A few weeks ago now I met up with some other Stampin' up! demonstrators in Essex to play with some of the new catalogue product. This card was one of our make and takes and I loved how simple it was to make and yet how effective it was. 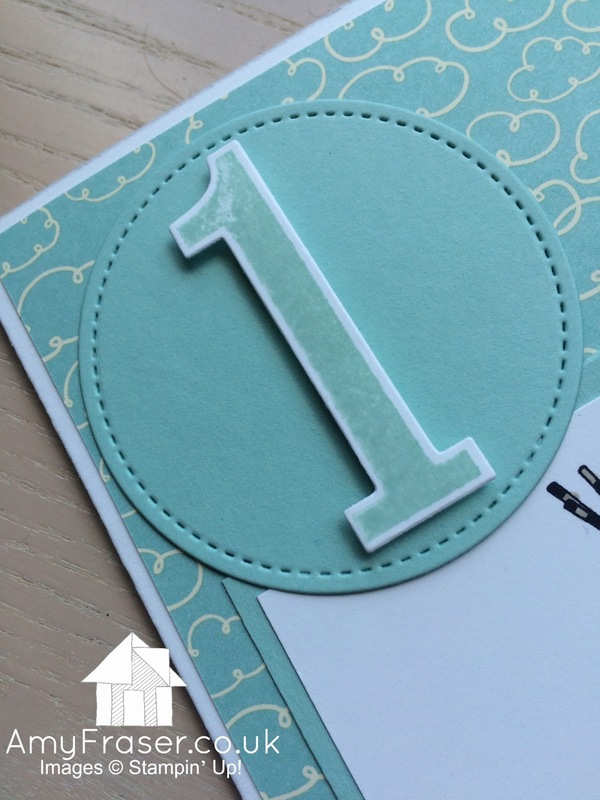 So I thought I would share this lovely card to start off a brand new Stampin' up! catalogue! The background colour I used is one of our new In-colours and is called Berry Burst. Expect to see a lot of products in this colour as I absolutely adore it! I also used one of my favourite products that we have had available to us for a little while now. The Stitched Shapes Framelits take projects to the next level and make cards look so pretty! I'm putting it out there, I 💛 this bundle. 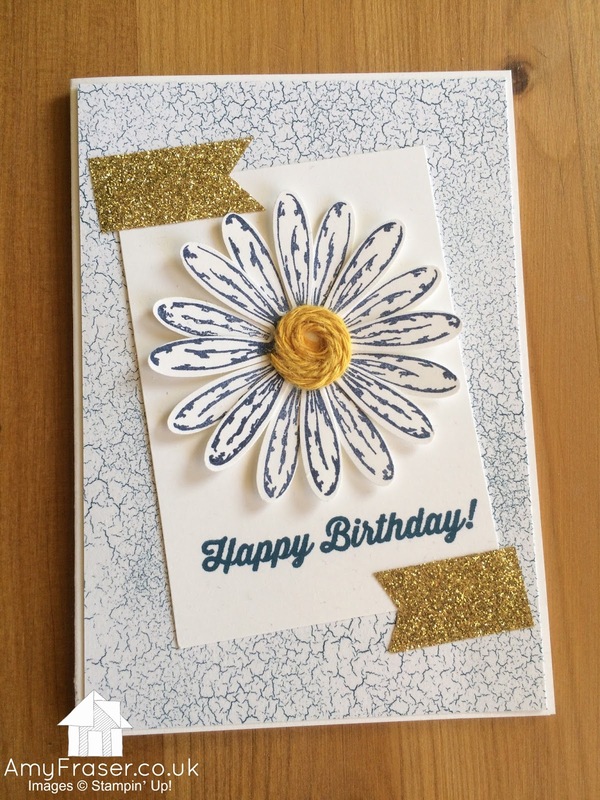 It's called Daisy Delight and the stamp set is beautiful with great thank you sentiments and the punch is so fun! Can't you just see hundreds of daisy decorations using this bundle? The Double-Stitched Ribbon I used here is great as one side has crosses and the other side has straight line stitches. It's available in three super colours: Blushing bride, Cherry Cobbler and as I used here Daffodil Delight. The final finishing touch was a gold faceted gem which is also new today in the catalogue! They are available in gold and clear and they are just perfect for use with the daisies. Thanks for stopping by today, have a lovely week! Unknown 6:00 pm Birthday, colour challenge, featured, GDP081, Stampin' Up! You may have heard of the Global Design Team and the weekly challenges they hold over on their website. If you haven't, check it out as its a great place for inspiration. To get myself back into the swing of things I thought I would join in with challenge 81. I loved the colour challenge and inspiration hit me straight away. I created the project on the first day of the challenge, unheard of for me. But then I never got the chance to upload it for the challenge. I really loved the card and the colour combination is one of my favourites so I thought I would show it to you anyway! Take a look at what other people created here and why not try joining in with the future challenges yourself? I'm hoping to get involved in more of the GDP challenges now that I know how fun they are! I really loved this stamp set - Big on Birthdays - in the spring summer catalogue although maybe you have passed it by, due to one particular stamp in the set? More on that another day! 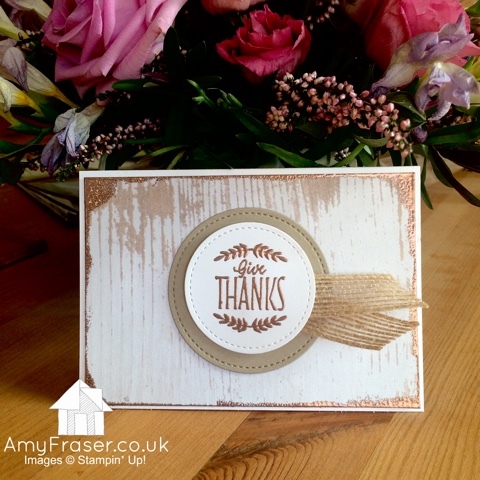 I am so pleased it is staying around for the next year of the Stampin' Up! catalogue. Expect to see more of this stamp set in the future! 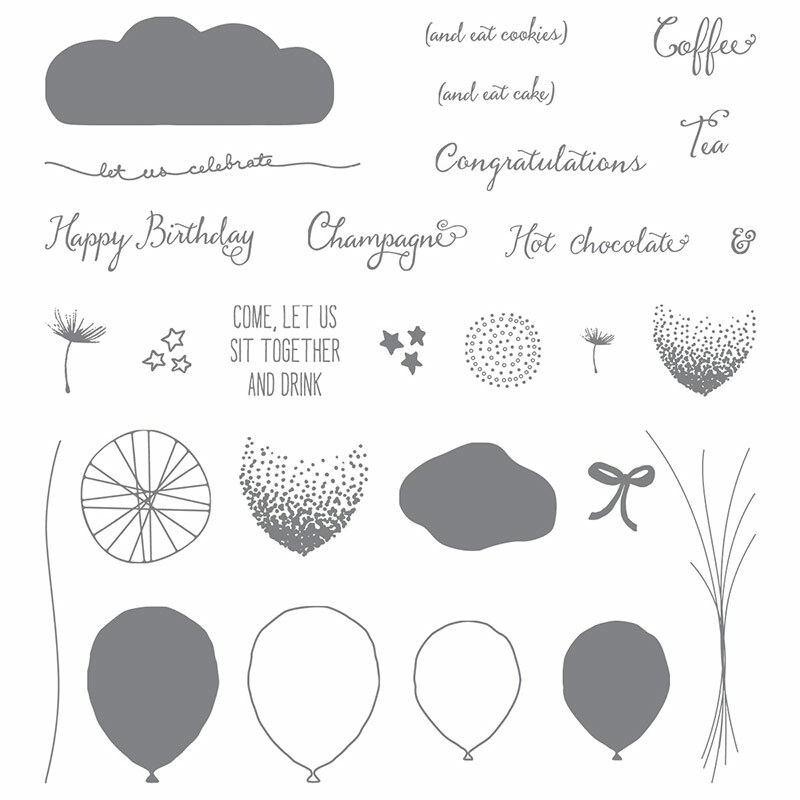 I'm also looking forward to playing with all the new products available in the new Stampin' Up! catalogue which launches Thursday!! If you don't already have a catalogue get in touch and I will get you one in the post this week! A change is as good as a rest... but sometimes you need both! 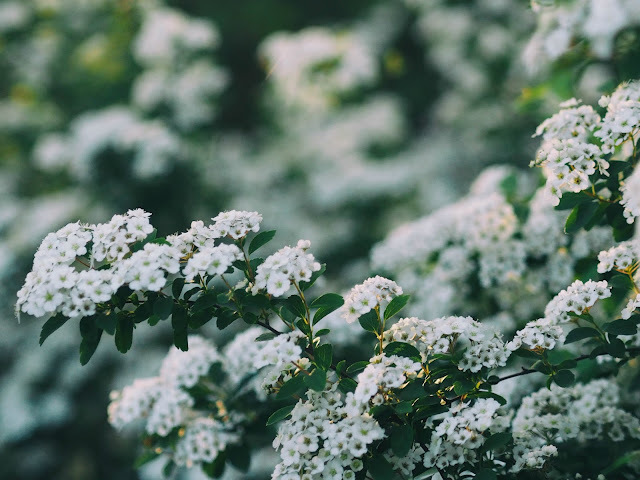 It's been a very long time since I last posted on my blog and my social media has been quite empty as you may have noticed. But while this "vacation" wasn't planned, it has been so good for me and feels like clicking a refresh button on things! 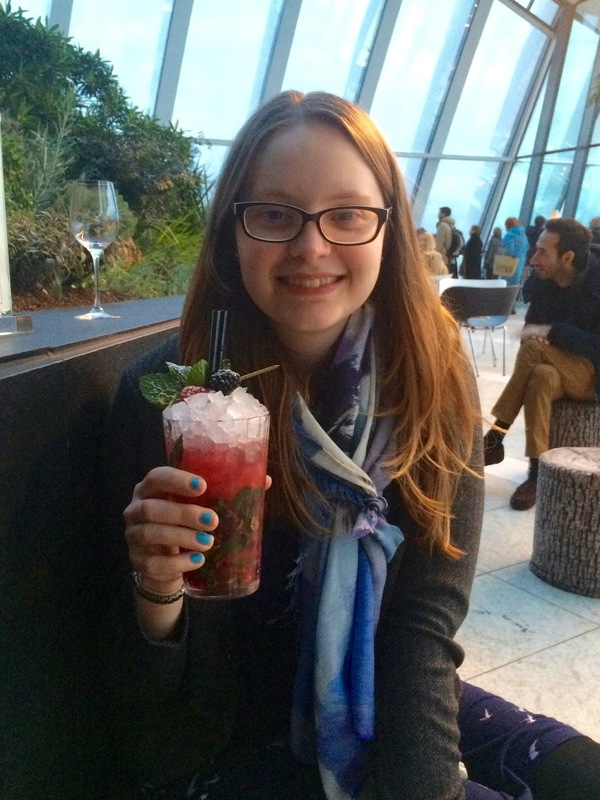 Last Autumn, after a few rubbish months career wise, I decided to make some major changes in my life. As a person who struggles with change this was not what you would call easy but I knew that it was what I wanted and so I persevered. Suddenly just before christmas lots of things happened all at once, and while I had been working towards them it was all still a surprise when it arrived! So, at the start of 2017 I left my job in Kent, took a lovely few weeks holiday, came home to my lovely Sevenoaks flat and packed up all my belongings - well the movers did! Then I along with a (un)surprisingly large moving lorry journeyed to Cambridge. I've since started a brand new job in the centre of Cambridge, made lots of new friends, caught up with old ones and unpacked all the moving boxes (almost). My new home and job has changed the way I live my life in a lot of ways. I'm enjoying a more active lifestyle, being much more sociable, trying new things and rediscovering some old hobbies! My new home also comes with the benefit of a craft room/office which has made me very happy. I took the opportunity while going through the move to reassess crafting and why I enjoyed it in the first place! While I haven't been sharing my crafting I have actually been really productive and rediscovering my love of crafting for me and those I love! So while I am not promising to be reliably back online, I mean when have I ever been? I am looking forward to doing what I love and sharing what I do! If you are interested in what CASE the Catalogue is all about or if you are wondering what a CASE even is, please check out my previous post here. Today I am showing you a CASE from a catalogue which you might not actually have... It's the Spring summer catalogue which was available between January and May. 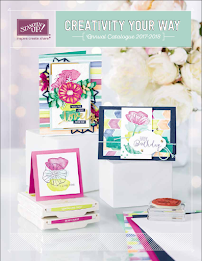 While you may no longer be able to purchase from this catalogue I always advise my customers to keep hold of past catalogues, because they can still provide serious inspiration! The 2016 Spring/Summer catalogue was no exception and there were so many great ideas that I didn't actually get a chance to try them all! Luckily a load of the stamp sets are still available so I can still try them now. Now I have to admit I am a bit of a sucker for dandelions, when I was small I used to love blowing them into the sky and making wishes! I really wanted to stay close to this project for my CASE today and decided to keep the dandelion and watercolour paper but change the colours a little. I thought I would go a little stormy with the colours. I used a combination of blue shades with a aqua painter to make the background and finished it off with some white craft ink and a dauber to give it a bokeh effect. 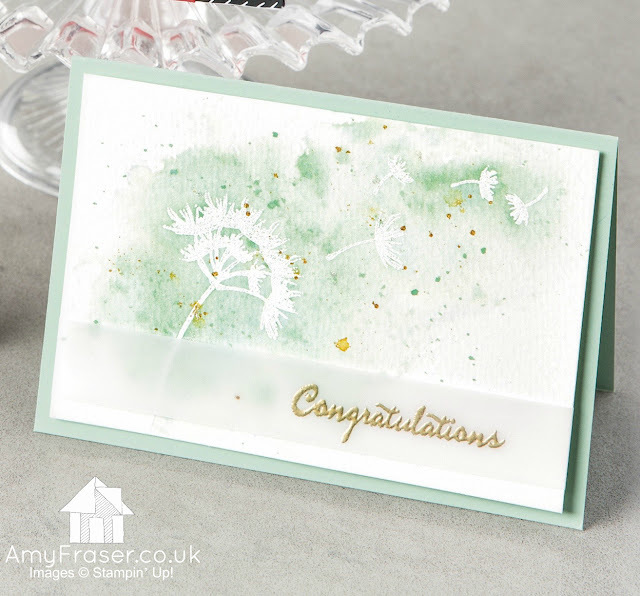 I used Versamark and White embossing powder to make the dandelion. I will admit this is a bit of a fiddle as its hard to see where you have stamped with the Versamark to line up the next dandelion stem, but I think the overall effect is lovely and worth the effort. I actually think the imperfection makes it better! 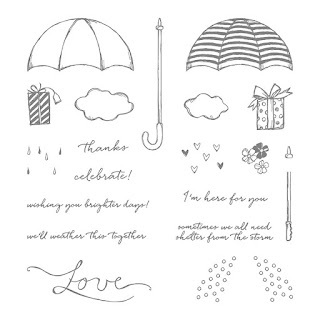 I found the perfect sentiment for the card in the "Weather Together" stamp set. I didn't want the sentiment to take away from the design and felt that this really finished the card off. I really love this sentiment and am so glad I found a card to use it on. 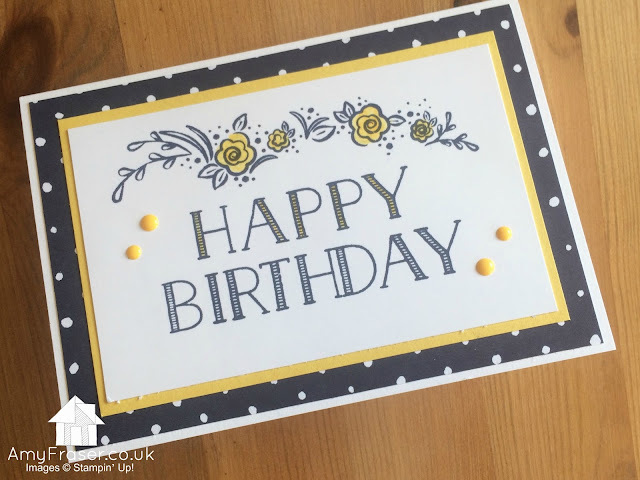 If you like the above card and would like to make it or something similar yourself at home with a group of friends for free, then please read my party page here and check out my Facebook page for a great offer and competition which is running for the whole of September and October! Don't forget that today marks the start of a new Week of special offers with products at up to 25% off! Click the link below to find out more and see which products are available this week! Below are some of the supplies I used to create my card. If you wish to purchase any of the items, just click on the images below to go straight to my online shop where you can place your order or get in touch. Remember if your order is less then £150 to enter the monthly hostess code to receive a special thank you from me. 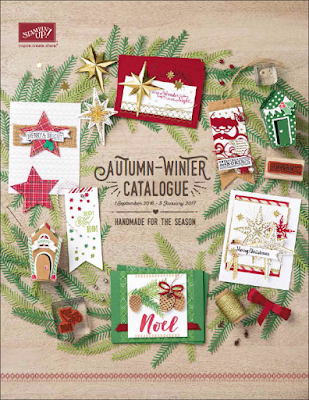 Don't Forget to download the new Christmas Catalogue by clicking the picture below!